Or are they? You decide. I’m not going to comment on the vocals – I’m sure my fellow Lloyd Webber nerds in the audience can make that judgment for themselves – but I do want to make a brief remark about the orchestration. Personally, I am of the belief that the farther this movie gets away from the 1980s, the better. Part of the benefit of translating a stage musical to film is that you can do away with the pit and have a full philharmonic orchestration in the vein of what John Williams won an Oscar for doing in Fiddler on the Roof. As for the sample on that promotional website I linked to above, its percussiveness draws it closer to the stage production, but I do have to wonder how this will turn out in the finished product. It is unclear to me at this point whether Schumacher is aiming for a completely period-authentic Phantom or a composite of period visual stylings and the contemporary Lloyd Webber sound. And now for something completely different: Spock may play chess in three dimensions, but can he play Scrabble in several languages at once? Those of you who are big on the Tenting for Tuition craze that seems to be all the rage around these parts for reasons pertaining to the word “freeze” should take note: this is how it’s done. Indeed, you can only conceal so much from the Muggles. I conclude this post with a print advertisement – or a fingerprint advertisement, as the case may be. 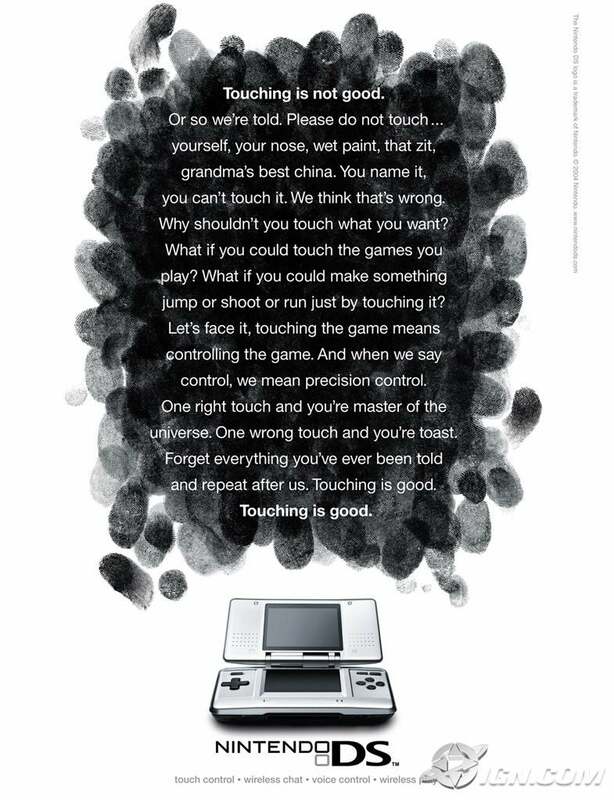 Alongside this, it seems that while I was looking the other way, Nintendo somehow assembled a competent marketing department.